The only DUOTONE Center in El Gouna, Red Sea. Test brand-new DUOTONE equipment in our shallow lagoon! Bring your Family and have a lot of fun! Your kids will love our playground. FOIL-Kiting! Fly with our F2 and Nobile Foil over the Red Sea! Foil = Fun at light wind. We offer kiting and windsurfing courses for children. The only lagoon deep enough for surfing during low tide! No reef. Enjoy your perfect kite and windsurf holiday! Enjoy kiting with the latest F2 equipment in el gounas biggest lagoon! Have a sundowner, join our BBQ. Happy Hour every evening. We are F2 Pro Center! Test brand-new F2 boards and sails! Private courses for all levels. Perfect for waterstart and advanced riders in light winds. Please bring neoprene shoes with you for Kitesurfing and Windsurfing. ELEMENT WATERSPORTS is proud to offer a selection of DUOTONE kiteboarding kites and kiteboards for rent and sale in El Gouna since the beginning of November 2016! Our DUOTONE kiteboard rental gives our customer the unique opportunity to ride with this fanatstic material in one of the best spots in El Gouna. Hydrofoil offers new incredible sensations and experiences. It is an amazing tool that you can ride from 5-6 knots, which is (almost) faster than the wind and reminds of hydrofoils-boats. It is a flying over the water and a pure glide in perfect silence. The upwind capacity is amazing. Some even speak of a “flight-obsession” that the Foilkiting caused with them. We have alwys enough water for Foilkiting. At high tide you can directly start from the beach after a 10-15m walk. We also built up a plattform, which anker near the deep water if you wish to start with a long fin on your Foil. Our boat will bring you overthere. Please bring neoprene shoes with you. Flysurfer Showroom! Low Wind? - NO PROBLEM! Flysurfer-Egypt is in the first row with its own Flysurfer showroom at ELEMENT WATERSPORTS! If you want to learn kitesurfing, training with our Flysurfer kites is super easy because it's like driving an automatic car. Only three steps and you are on the board. Annoying pumping up and sorting lines are not part of our Flysurfer kites! Flysurfer-Egypt offers kite courses for beginners and advanced as well as kite rentals and sales. get first 1 hour lesson and then the free test drive. Our tip: In absolute light wind, just try our 21m² kites! read more zu Flysurfer Showroom! Low Wind? - NO PROBLEM! Are you tired of transporting your gear from and back to your hotel everyday? Just drop it off on your way from the airport and leave it here during your holidays. Rent one of our rooms (boxes) to store your kites, boards, neoprene, harnesses and all the gear you brought with you. rescue boat service to take you back to the shore if necessary. Book your kiteboarding storage now! 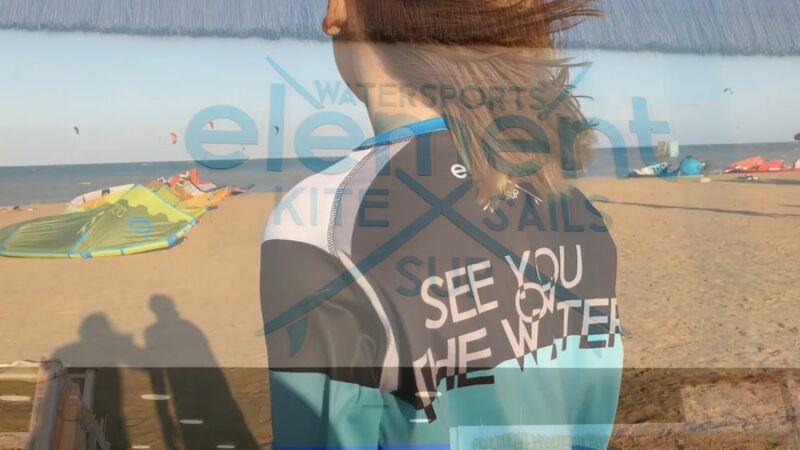 Element Watersports - see you on the water! Element Watersports from the air from Element Watersports on Vimeo. Kitecamp_Heaven7_Element from heaven 7 on Vimeo.